Oculopharyngeal muscular dystrophy (OPMD) is a rare, late-onset, autosomal-dominant disease affecting 1:100,000 individuals in Europe. OPMD is due to mutation in the N-terminal domain of exon 1 of the polyA-binding protein nuclear 1 (PABPN1). Patients with the disease express an expanded PABPN1 (expPABPN1) ranging from 11 to 18 alanines instead of the normal 10. OPMD is mainly characterized by ptosis and dysphagia, although muscles of the lower limbs can also be affected late in life. Currently, OPMD patients are referred to surgeons for a cricopharyngeal myotomy or corrective surgery to extraocular muscles to ease ptosis. Pharmacological treatments are not commercially available, but several compounds are in preclinical and clinical stages of development. A gene therapy approach designed to inhibit the expression of expPABPN1 is an appealing strategy. However, due to the type of mutation, genetic strategies to knock down expPABPN1 invariably affect the expression of wild-type PABPN1 with potential negative consequences for the treated muscles. We recently demonstrated that a dual gene therapy approach designed to inhibit mutant and wild-type endogenous PABPN1 by shRNA, in combination with expression of an RNAi-resistant sequence-optimized recombinant PABPN1 gene, substantially rescues the pathology in the A17 mouse model of OPMD. 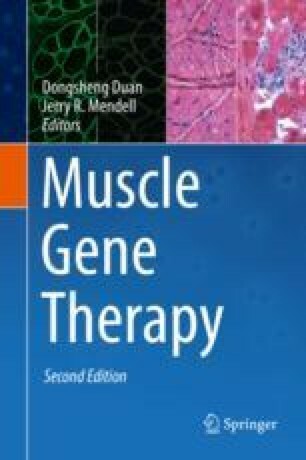 This is currently the only preclinical gene therapy study for OPMD. In this chapter, we describe this approach in a general context of other possible treatments for OPMD, and we discuss the likely future developments that may allow the translation of such an approach towards a therapeutic treatment for OPMD in humans.